Juan Beniquez played for the Pawtucket Red Sox first when they were a double-A team (1970) and then in 1973. Beniquez played short, outfield, third and second. But mostly outfield and shortstop. And then outfield, 'cause he was a terrible infielder. 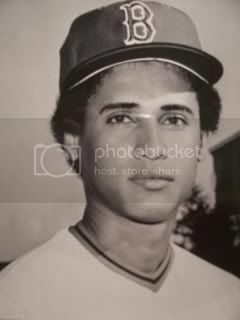 In 1973, at age 23, Beniquez batted .298 in 131 games. He hit 13 home runs nad led the team in runs with 80. This run total placed him fourth in the IL. 1. Steal second? Don't mind if I do, said Beniquez. He was second place in the IL for stolen bases in 1973. 2. Probably most shocking of all is that Beniquez won the IL batting title in '73 with his .298 average. Juan Beniquez' stately portrait is located in the middle portion of the third base tower. I know this portrait well. The eyes, the serene face. It's what Jesus might have looked like if He ever felt smug about his beneficence.